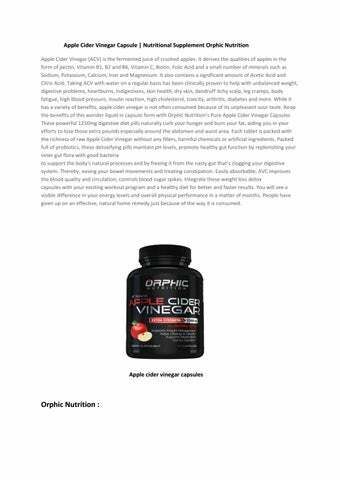 Apple Cider Vinegar Capsule | Nutritional Supplement Orphic Nutrition Apple Cider Vinegar (ACV) is the fermented juice of crushed apples. It derives the qualities of apples in the form of pectin, Vitamin B1, B2 and B6, Vitamin C, Biotin, Folic Acid and a small number of minerals such as Sodium, Potassium, Calcium, Iron and Magnesium. It also contains a significant amount of Acetic Acid and Citric Acid. Taking ACV with water on a regular basis has been clinically proven to help with unbalanced weight, digestive problems, heartburns, indigestions, skin health, dry skin, dandruff itchy scalp, leg cramps, body fatigue, high blood pressure, insulin reaction, high cholesterol, toxicity, arthritis, diabetes and more. While it has a variety of benefits, apple cider vinegar is not often consumed because of its unpleasant sour taste. Reap the benefits of this wonder liquid in capsule form with Orphic Nutritionâ&#x20AC;&#x2122;s Pure Apple Cider Vinegar Capsules These powerful 1250mg digestive diet pills naturally curb your hunger and burn your fat, aiding you in your efforts to lose those extra pounds especially around the abdomen and waist area. Each tablet is packed with the richness of raw Apple Cider Vinegar without any fillers, harmful chemicals or artificial ingredients. Packed full of probiotics, these detoxifying pills maintain pH levels, promote healthy gut function by replenishing your inner gut flora with good bacteria to support the body's natural processes and by freeing it from the nasty gut thatâ&#x20AC;&#x2122;s clogging your digestive system. Thereby, easing your bowel movements and treating constipation. Easily absorbable, AVC improves the blood quality and circulation, controls blood sugar spikes. Integrate these weight loss detox capsules with your existing workout program and a healthy diet for better and faster results. You will see a visible difference in your energy levels and overall physical performance in a matter of months. People have given up on an effective, natural home remedy just because of the way it is consumed. 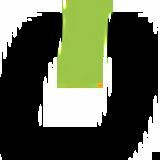 At Orphic Nutrition, our mission is to empower people to become the best version of themselves. The products we create are designed to help people look and feel their best. The Orphic Team believes that people performing at their optimum can change the world. We strive to revolutionize the industry by providing people with the purest, highest quality supplements, vitamins, and products that your body needs to perform at its best.